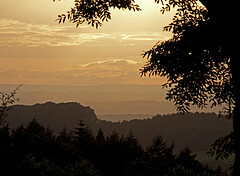 Rising to a height of 316m at the summit of Walton Hill, the Clent Hills are frequented by around one million visitors every year. Of these most are walkers, but the extensive bridleways also attract plenty of horse-riders. Situated about 15km South-West of Birmingham city centre, Clent Hills provide a haven of tranquillity away from the hustle and bustle of urban life, making them Worcester’s most popular no-fee attraction. One of the constituents of the Clent Hill range, Wychbury Hill, is the site of an Iron Age hillfort with two sets of ramparts and two ditches. Otherwise known as Wychbury Ring, this hillfort is a brilliant place to go and see whilst on a walk. Also dotted about on the hills are various structures built by Lord Lyttelton of Hagley Hall. Although most are situated within the grounds of Hagley Hall, they are largely visible from the surrounding public areas. Examples include a temple of Theseus, numerous Greek and Roman temples and even a to-scale mock castle. These follies and Iron Age leftovers aren’t the only history scattered across the Clent Hills however. There are many tales of bloody battles, murder and intrigue. Take the legend of St. Kenelm for instance, who met a gory end on a hunting trip in the area. Widely speculated to have been murdered, a Church named after him now lies in the suspected place of his demise. There is so much to investigate in the Clent Hills that wildlife lovers, exercise fanatics, horse-riders and those of you just looking for a bit of peace will not be disappointed with a day there. Why not take a picnic and walk to the top of the hills to experience panoramic views? On a clear day you can see as far as the Cotswolds, the Peak District, Charnwood Forest and the Black Mountains of Wales. Opening Times: all day, all year round.